Finding a great place for your loved one to live is a huge task. Placement agencies (or referral agencies) exist to ease the burden on families. Placement agencies weed out the bad, seek out the good, and show you what you can get for your budget. That said, even picking a placement agency can seem like an impossible task. How do you know that you can trust a placement agency? Will they have your best interests at heart? Will they care about your search, or will you be just another client? We are confident that our senior living consultants provide fantastic service for the families we help. But it’s important that you feel confident about the placement agency you chose. How do you chose a senior placement agency? The first thing you have to do is understand what a placement or referral agency is meant for. A placement agency is not a senior living facility or community. Placement agencies are the bridge between families and seniors, and the facilities that they are shopping around for. What should I ask about when choosing a senior placement agency? Ask the consultant you are working with how they vet the facilities you will be visiting. What do they know about their services? How often have they visited the facility? Get specific about what they do to make sure facilities provide the best care. 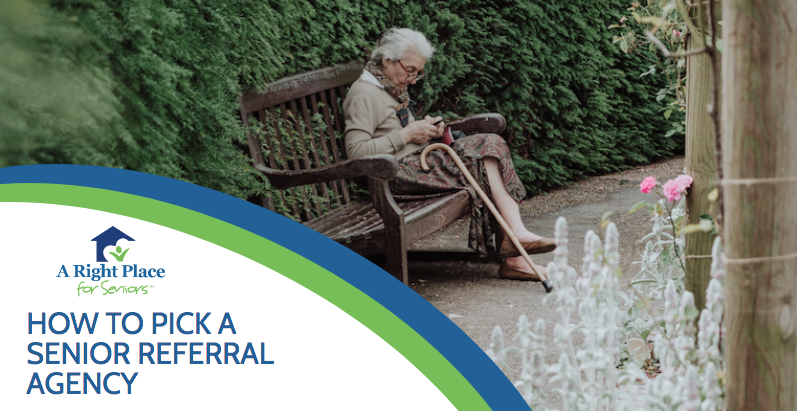 Not all referral agencies are created equal, so it’s important to be sure. Even though A Right Place For Seniors provide a free service, we are working for you! Your needs are of the utmost importance to us. Each of our senior housing consultants all over the country would be thrilled to answer these questions. If you are not in a region where A Right Place for Seniors has a location, this should still apply. A referral agency should be glad to answer your in-depth questions about process and vetting. Be sure to ask what experience is required of the people you will be working with. Some agencies do not have thorough experience requirements. When a consultant has years of experience in the senior living or health industry, it will greatly inform their success finding a great match for seniors. You want to work with someone who is an expert on senior housing. How does the placement agency get paid? This will inform whether or not you feel comfortable and safe with the agency. For example at A Right Place for Seniors, we are paid by facilities when a match is made. Though we are paid by facilities, we will only ever refer you to a facility that we believe fits your needs. Some agencies will only refer you to the senior housing facilities that they have deals with. Some agencies will refer you to too many facilities, without any regard for your needs or preferences. Some agencies collect a fee from the family or senior that they work with. Learning about the payment structure of a placement agency is not only a great idea. It is also a great way to build trust with the consultant you choose. If they are honest and transparent with you, you are at the start of a great search. This applies to all of the questions listed above. Now you can find a great placement agency! We hope this guidance is empowering and gets you started on a great search. A Right Place for Seniors is a placement agency that matches you with a senior housing expert. Our services are always free. We guide your search for senior housing, based on your needs and preferences. If you would like to learn more about our free services, feel free to contact us! We pride ourselves on transparency and making quality senior housing matches.